This article is about a religion. For the religious television program, see Ang Iglesia Ni Cristo. Iglesia Ni Cristo (Church Of Christ) (Tagalog pronunciation: [ɪˈglɛ̝ʃɐ ni ˈkɾisto̞], abbreviated as INC) is an independent nontrinitarian Christian religious organization that originated in the Philippines. It was registered in 1914 by Felix Y. Manalo, who became its first Executive Minister. INC claims itself to be the one true church and the restoration of the original church founded by Jesus, and that all other Christian churches are apostates. INC doctrine cites that the official registration of the church with the government of the Philippines on July 27, 1914, by Felix Y. Manalo—upheld by its members to be the last messenger of God—was an act of divine providence and the fulfillment of biblical prophecy concerning the re-establishment of the original church of Christ in the Far East concurrent with the coming of the seventh seal marking the end of days. By the time of Manalo's death in 1963, INC had become a nationwide church with 1,250 local chapels and 35 large concrete cathedrals. His son, Eraño G. Manalo, became the next church leader and led a campaign to grow and internationalize the church until his death on August 31, 2009, whereupon his son, Eduardo V. Manalo, succeeded him as Executive Minister. In 2015, the Philippine census by the Philippine Statistics Authority found that 2.64% of the population in the Philippines are affiliated with the Iglesia Ni Cristo, making it the religion with the third largest number of adherents, with Islam at 6.01% and Roman Catholicism at 79.53%. During American colonial rule over the Philippines, there were a variety of rural anti-colonial movements, often with religious undertones, and American Protestant missionaries introduced several alternatives to the Roman Catholic Church, the established church during Spanish colonial period. Felix Y. Manalo, born on May 10, 1886, in Taguig, Philippines, was baptized in the Roman Catholic Church. In his teenage years, Manalo became dissatisfied with Roman Catholic theology. According to the National Historical Commission of the Philippines, the establishment of the Philippine Independent Church (also called the Aglipayan Church) was his major turning point, but Manalo remained uninterested since its doctrines were mainly Catholic. In 1904, he joined the Methodist Episcopal Church, entered the Methodist seminary, and became a pastor for a while. He also sought through various denominations, including the Presbyterian Church, Christian Mission, and finally Seventh-day Adventist Church in 1911. Manalo left Adventistism in 1913 and associated himself with atheist, and agnostic peers. On November 1913, Manalo secluded himself with religious literature and unused notebooks in a friend's house in Pasay, instructing everyone in the house not to disturb him. He emerged from seclusion three days later with his new-found doctrines. Manalo, together with his wife, went to Punta, Santa Ana, Manila, in November 1913 and started preaching. He left the congregation in the care of his first ordained minister and returned to his native Taguig to evangelise; there, he was ridiculed and stoned at his meetings with locals. He was later able to baptize a few converts, including some of his persecutors. He later registered his new-found religion as the Iglesia Ni Cristo (English: Church of Christ; Spanish: Iglesia de Cristo) on July 27, 1914, at the Bureau of Commerce as a corporation sole, with himself as the first executive minister. Expansion followed as INC started building congregations in the provinces in 1916, with Pasig (then in Rizal province) having two locals established. The first three ministers were ordained in 1919. By 1924, INC had about 3,000 to 5,000 adherents in 43 or 45 congregations in Manila and six nearby provinces. By 1936, INC had 85,000 members. This figure grew to 200,000 by 1954. A Cebu congregation was built in 1937—the first to be established outside of Luzon, and the first in the Visayas. The first mission to Mindanao was commissioned in 1946. Meanwhile, its first concrete chapel was built in Sampaloc, Manila, in 1948. Adherents fleeing for the provinces away from Manila, where the Japanese forces were concentrated during World War II, were used for evangelization. As Manalo's health began to fail in the 1950s, his son Eraño began taking leadership of the church. Felix Manalo died on April 12, 1963. Within the span of 49 years of his administration, INC had 1,250 local chapels and 35 large concrete cathedrals. In 1965, INC launched its first resettlement and land reform program in Barrio Maligaya, Laur, Nueva Ecija. INC started operating a radio station in 1969 while its first television program aired in 1983. The Ministerial Institute of Development, renamed as "Iglesia Ni Cristo (Church Of Christ) School for Ministers", was founded in 1974 in Quiapo, Manila, and moved in Quezon City in 1978. In 1971, the INC Central Office building was built in Quezon City. In 1984, the 7,000-seat Central Temple was added in the complex. The Tabernacle, a multipurpose tent-like building which can accommodate up to 4,000 people, was finished in 1989. The complex also includes the New Era University, a higher-education institution run by INC. Eraño G. Manalo died on August 31, 2009. His son, Eduardo V. Manalo, succeeded him as executive minister upon his death. On July 21, 2014, former President Benigno Aquino III and INC executive minister Eduardo V. Manalo led the inauguration of Ciudad de Victoria, a 140-hectare tourism zone in Bocaue and Santa Maria, Bulacan, where the Philippine Arena is also located. The Philippine Arena, a 50,000-seat multi-purpose structure owned by the INC, currently holds the Guinness World Record for the largest mixed-used indoor theater. Philippine government declared the year 2014 as the "Iglesia ni Cristo Centennial Year" through Proclamation No. 815, whereas, the 27th of July of the same year was declared as a special non-working holiday to commemorate the 100th founding anniversary of Iglesia ni Cristo. On July 27, 2014, INC celebrated its centennial anniversary at Ciudad de Victoria, with Philippine Arena as the main venue, and in about 1,180 worship buildings worldwide through live video feed. The week-long celebration consisted of pyro-musical displays, worship service led by Manalo, oratorio, musical presentation, theatrical play, quiz show, and evangelical mission. For the worship service conducted for the INC centennial, INC secured two Guinness World Records for the largest gospel choir with 4,745 members and largest mixed-used indoor theater for the Philippine Arena with 51,929 attendees. On July 26, 2015, INC capped their centennial year through different activities such as International Unity Games, worship service led by Manalo, and Closing Centennial Celebration which were held at Washington D.C. United States, and the Philippine Arena. On October 4, 2015, INC, through Viva films, conducted the world premiere of Felix Manalo, a film depicting the origin of the INC and the life of its first executive minister, which was held at the Philippine Arena. According to the resolution passed by the Senate of the Philippines to commemorate INC's 104th anniversary, INC has already established more than 7,000 congregations in 151 countries and territories throughout the world. Iglesia Ni Cristo believes that it is the true church established by Jesus Christ in the first century, and that its registration in the Philippines is the fulfillment of biblical prophecies that Christ's church would re-emerge in the Far East. Because of a number of similarities, INC's doctrines have been described as restorationist in outlook and theme. The Iglesia Ni Cristo believes that the Bible is the only book inspired by God. It is the sole basis of all their beliefs and practices. The Iglesia Ni Cristo believes that God the Father is the creator deity and the only true God. INC rejects the traditional Christian belief in the Trinity as heresy, adopting a version of unitarianism. They believe that this position is attested by Jesus Christ and the Apostles. Christ and the Apostles are united in teaching how many and who is the real God. Similar to other true Christians, according to Apostle Paul, there is only one God, the Father—not the Son and more so not the Holy Spirit. The Apostles also did not teach that there is one God who has three personas who are also Gods. ... It [Trinity] is not found in the Holy Scriptures or the Bible, and if [Catholic] priests ever use the Bible to prove this teaching of theirs, all are based only on suppositions and presumptions. The church believes that Jesus Christ is the Son of God and the mediator between God the Father and humanity, and was created by God the Father. God sanctified him to be without sin, and bestowed upon him the titles "Lord" and "Son of God". The church sees Jesus as God's highest creation, believe that he is only a Man and denies the deity of Jesus. Adherents profess Jesus' substitutionary role in the redemption of humankind. He is believed to have been "foreordained before the foundation of the world" and sent by God "to deal with sin". Members "are saved by Christ's blood" who died because of his "self-sacrificing love". The Iglesia Ni Cristo believes that it is the one true church founded by Jesus Christ and was restored by Felix Manalo in the last days. They believe that the first century church apostasized in that century, or in the 4th century due to false teachings. INC says that this apostate church is the Roman Catholic Church. Meanwhile, its reestablishment is seen as the signal for the end of days. They believe that the Iglesia Ni Cristo is the fulfillment of the Bible verse, Isaiah 43:5, where "east" refers to the Philippines where the Church of Christ would be founded. INC teaches that its members constitute the "elect of God" and there is no salvation outside the Iglesia Ni Cristo. Faith alone is insufficient for salvation. The Iglesia ni Cristo says that the official name of the true church is "Church of Christ or Iglesia Ni Cristo (in Tagalog)". The two passages often cited by INC to support this are Romans 16:16 "Greet one another with a holy kiss. The churches of Christ greet you", and the George Lamsa translation of Acts 20:28: "Take heed therefore ... to feed the church of Christ which he has purchased with his blood." Felix Y. Manalo is said to be the restorer of the church of Christ, and "God's last messenger" (Sugo in Tagalog). INC says that Manalo is the "angel from the east", mentioned in Revelation 7:1–3 who started the INC at the same time that World War I broke out. This is the start of the period according to INC being referred to in the Bible as the ends of the earth (cf Is 41:9-10; 43:5-6) the time when the end of the world is near, even at the doors (cf. Mt. 24:3, 33), which began with the outbreak of a war of global proportions (cf. Mt. 24:6-7) Felix Manalo is from the Philippines, which they say is in the "center" of the Far East. The ‘four winds’ in Revelation 7:1-3, they say refers to World War I and the four angels are the four leaders known as the big four (Woodrow Wilson, David Lloyd George, Georges Clemenceau, and Vittorio Orlando) who they say worked on the prevention of the war to continue. Manalo is also portrayed as the fulfillment of several passages in Isaiah and other books of the Bible. Manalo's titles are "ravenous bird from the east" (Isa. 46:11), "worm Jacob" (Ps. 22:6-7), "one shepherd" (John 10:16) and "the third Elijah" (Mt.17:10-11; Mal.4:5) and proclaimed to be an "Angel" on the book of Revelations. As the one who sent by God to restore INC, Manalo became the first executive minister and spiritual leader of the church. As such, he taught that what is written in the Bible was the ultimate authority in all aspects of the church, and effectively as a messenger of God, Manalo is "the foremost Biblical authority for all humanity and the divinely designated leader of a reestablished church of Christ in the modern world." The church believes that baptism is done by immersion baptism or Believer's baptism by adults in water, and that it is necessary that people be baptised in the Iglesia Ni Cristo to become disciples of Jesus Christ. The church rejects infant baptism. Newborn children of members are instead dedicated to God through a congregational prayer, led by an ordained minister of the INC.
People who wish to be baptized in the INC must first submit to a formal process taking at least six months. Once someone officially registers with their local congregation, the person is given the status of being a Bible student (Tagalog: dinudoktrinahan) and taught the lessons concerning fundamental teachings and its beginnings in the Philippines. These lessons are contained in the doctrine manual written by Eraño G. Manalo entitled "Fundamental Beliefs of the Iglesia Ni Cristo". This book is given to ministers, evangelical workers, and ministerial students of the INC. Each lesson is usually thirty minutes to one hour in length. After hearing all the lessons, the students enters a probationary period (Tagalog: sinusubok) during which they are obliged to attend fifteen once-a-week group prayer meetings, where they are taught to pray and are guided in their adjustment to the INC lifestyle. When the sixth month comes, students who have been active in attending the twice-a-week worship services and whose lifestyles are in accordance with INC doctrines are screened before being baptized. During the screening, they are asked questions about the teachings of the church. Members who are not living in accordance with the doctrines taught in the INC are admonished. Those who continue in violation of INC doctrines after being admonished are excommunicated or expelled from the INC and thus lose salvation, and therefore, the church does not believe in the perseverance of the saints. Certain violations, such as eating blood,[a] being absent from worship services too long without any solid reason, drinking alcohol, or marrying or having a romantic relationship with a non-member may result in mandatory excommunication. INC believes that a person is composed of a body ("vehicle"), soul ("individual") and spirit ("life" or fuel). Members believe that when a person dies, his/her body and soul both die and go into the grave where both will remain until the Second Coming of Christ, whereas the spirit will go back to God. Upon Christ's return, all dead servants of God, from the time of the patriarchs up to the last days, would be resurrected to join living faithful and loyal INC members. They will be rewarded by living in the Holy City or New Jerusalem, together with God the Father, and Jesus Christ. At the right time chosen by God, a second resurrection would occur, and non-INC members will experience second death which is the Lake of Fire (Dagát-dagatang Apóy). The church believes that God set a day where He will judge all people. They believe that this day is also the Second Coming of Jesus Christ. INC divides time into three eras: the era of the Patriarchs from creation to the birth of Moses, the era of the Prophets from the birth of Moses to the birth of Jesus, and the Christian era from the birth of Jesus to the Last Judgment. Adherents believe Felix Manalo to be the last messenger of God in the Christian Era. The church conducts regular worship services, one during the week, and one during the weekend, conducted in the local languages (providing sign language interpreters and translators in some congregations). It consists of singing of hymns, prayers, studies of the bible, collection of voluntary offerings, and benediction. Both God the Father and Jesus are worshiped. The ministers of every congregation in a given worship service use the same sermon outline prepared by the executive minister. Deacons and Deaconesses guide worshipers to their seats and collect voluntary offerings. The singing of hymns is led by the locale's choir. The first hymnbook, termed Ang Himnario ng Iglesia Ni Cristo, which consists of 300+ songs, was published in 1937. Children’s worship services (Tagalog: Pagsamba ng Kabataan or PNK) are held every weekend. They use similar lessons as the standard worship services taught using the Socratic method (question and answer). The church teaches that willfully forsaking the worship service is a grievous sin, thus members are expected to attend the congregational worship services twice a week without fail. The church encourages its members to make prayer a part of everyday life. Thus, prayer before various activities, such as taking meals and going to sleep, are commonly practiced. Prayers recited in rote repetition are not observed. Since February 1939, the church has been publishing Pasugo (English: God's Message) in both Tagalog and English. Filipino has been the only language used since its inception in 1939 until 1953. Currently, about two - thirds of its pages are devoted to the English - speaking population. Felix Manalo wrote its first editorial where he stated the publication's purpose, including the propagation of the faith. Issues contain articles which detail INC doctrines and refute doctrines which it considers as heresy, such as the Trinity. It also features information on church history, educational programs and missionary achievements, including lists and photographs of newly dedicated chapels. In 2001, it had a monthly circulation of 235,000 copies. For the year 2009, there were more than four million copies of Pasugo distributed worldwide. INC holds religious gatherings called evangelical missions regularly which aim to attract more followers. On February 28, 2012, INC held its largest Philippine-wide evangelical missions simultaneously on 19 sites across the country. In Manila site alone, more than 600,000 people attended the event. On April 13, 2013, INC launched Lingap-Pamamahayag under its project Kabayan Ko, Kapatid Ko (English: My Countrymen, My Brethren), which incorporates outreach missions to its evangelical missions. On September 26, 2015, INC held its first worldwide evangelical mission at the Philippine Arena as the main venue and in 2,125 sites throughout the world through video conferencing. It was officiated by INC executive minister, Eduardo Manalo. INC members participate in the charity walk, "Worldwide Walk to Fight Poverty", in Manila. On November 19, 1981, INC has launched the Lingap sa Mamamayan (Aid To Humanity) Program. The program aims to provide relief goods, health care, and other services to the needy, especially those who are afflicted by calamities and disasters. It also provides seminars for disaster preparedness, first aid, and family planning. Other humanitarian activities such as blood donation and community clean up drives were also conducted in different parts of the world where the Iglesia Ni Cristo is established. Felix Y. Manalo (FYM) Foundation, the INC's arm in executing the Lingap sa Mamamayan and other related programs, was formally registered in the Philippines on February 4, 2011, and in the United States on May 17, 2012. The institution is also recognized in Japan, South Korea, Spain, and Russia. INC also established the Unlad International, Inc in 2012. It is the INC's arm in providing sustainable livelihood to its members. On July 7, 2012, the INC Lingap sa Mamamayan was conducted in the slums of Parola in Tondo, Manila and was awarded three Guinness world records for breaking records in the most people involved in a dental health check, the most blood pressure readings taken in 8 hours and the most blood glucose level tests in 8 hours. On April 29, 2016, four more Guinness world records were broke by the INC. These records are the largest collection of clothes for recycle/donation, the most shoes donated to charity in 24 hours, the most medical ultrasound examinations in eight hours, and the most medical risk assessment in eight hours which was also held in Tondo, Manila. On February 22, 2014, INC conducted another Lingap sa Mamamayan at its first resettlement project in Barrio Maligaya in Palayan City, Nueva Ecija. Coinciding with the barrio's 49th anniversary, INC bagged another world record after setting the record for the most number of hunger relief packs distributed within eight hours. A total of 302,311 hunger relief packages were given. On March 14, 2014, after conducting a worship service in Tacloban, Leyte, INC executive minister Eduardo V. Manalo, led the groundbreaking ceremony of the EVM Self-Sustainable Community Rehabilitation Project in Sitio New Era, a 3000-hectare property of the church in Brgy. Langit, Alang-alang, Leyte. The project which costs more than one billion pesos includes at least 1000 housing units for the survivors of super typhoon Haiyan. Garments and dried fish factories, and eco-farming project are also included to provide livelihood to the community. More than 150,000 hunger relief packages were also given which contains 3 kilos of rice, canned goods and instant noodles aside from the free medical and dental services conducted that day. On January 23, 2015, Manalo inaugurated the livelihood and housing project. On November 9, 2015, Manalo inaugurated a community project for Kabihug tribe, an indigenous group in Camarines Norte. The project is situated in a 100-hectare land which includes 300 housing units, calamansi orchard, ecological farm, dried fish factory, garments factory, clinic, learning center, and an INC worship building. After 6 months, another housing and eco-farming community project was inaugurated by the church on May 27, 2016 for the B'laan tribe in Bgy. Danlag, Tampakan South, South Cotabato in southern Philippines. Eduardo V. Manalo, Iglesia Ni Cristo's current Executive Minister. Iglesia Ni Cristo has had three Executive Ministers (Tagalog: Tagapamahalang Pangkalahatan) that lead the Church Administration in overseeing the faith of the members. Eduardo V. Manalo, as the current Executive Minister, serves as the church's leader, and, in this capacity, manages the administration of the church. Along with other senior ministers which comprises the Church Economic Council (Tagalog: Lupon ng Sanggunian), the Executive Minister forms the Central Administration of Iglesia Ni Cristo. All church ministers and ministerial workers are male, however, there are numerous female church officers. Ministers are encouraged to marry for the purpose of obeying the command to marry and multiply, and to become effective counselors to church members with family-related problems. The Central Office in Quezon City, built in 1971, is Iglesia Ni Cristo's headquarters. The Central Office is one of several structures inside the INC Central Office Complex. It houses the permanent offices of the central administration and some of the church's departments. It is here where about a thousand INC professionals and volunteers hold office. It was located in Manila during its early years, then in San Juan, and later in Makati, before moving to its present site. INC also has three main offices outside the Philippines; in Burlingame, California, Washington D.C., USA and in Heathrow, London, United Kingdom. Administration and ministerial work are delegated into ecclesiastical districts (termed divisions until 1990) which are led by District Ministers (formerly, division ministers). Ecclesiastical districts comprise 40 congregations (referred to as locales) on average. All locales were directly managed by Felix Y. Manalo until 1924 when the first ecclesiastical district was organized in Pampanga..
INC churches in Montclair, California and Washington, D.C.
Iglesia Ni Cristo church buildings primarily serve as places of worship and are used for other religious functions. These are described by Culture and customs of the Philippines, a book published by Greenwood Publishing Group, as structures "which employ exterior neo-Gothic vertical support columns with tall narrow windows between, interlocking trapezoids, and rosette motifs, as well as tower and spires." There are multiple entrances leading to the main sanctuary, where males and females sit on either side of the aisle facing a dais where sermons are made. The choir loft is located behind the dais, and in larger churches, a baptistry with pools for immersion baptism is located at the back of the church. Meanwhile, Fernando Nakpil-Zialcita, an anthropologist from Ateneo de Manila University, said that INC churches can be uniquely identified for "its exuberant use of fanciful forms and ornaments [and a] brilliant white facade whose silhouette is a cusped Gothic arch or a flattened Saracenic arch." The distinctive spires represent "the reaching out of the faithful to God." Prominent architects, such as Juan Nakpil (a National Artist of the Philippines for architecture) and Carlos A. Santos-Viola, had been involved in designing INC churches while the Engineering and Construction Department of INC, established in 1971, oversees the uniformity in design of church buildings. The first chapel was built on Gabriela Street in Tondo, Manila in 1918, fashioned out of sawali (woven leaf panels), nipa and wood, typified the style and materials of the early chapels. After World War II, INC began to build concrete chapels, the first of these in Washington (Maceda), Sampaloc, Manila completed in 1948. Next came the chapel and former official residence of the executive minister in San Juan, Rizal (now San Juan City, part of Metropolitan Manila). The complex in San Juan was designed by Juan Nakpil. The Central Temple which opened on July 27, 1984, can accommodate up to 7,000 persons was designed by Carlos A. Santos-Viola. The Central Temple features octagonal spires, "fine latticework" and ribbed windows. Recent buildings are variations on the designs of the Central Temple. These are designed to accommodate 250 to 1,000 persons while larger churches in Metro Manila and provincial capitals can accommodate up to 3,000 persons. INC churches outside the Philippines which were acquired from different religions undergo intensive renovations to meet the standard of their worship services. Since most of INC churches abroad were acquired from different religions, there is significant variation from one house of worship to another. President Rodrigo Duterte meets with Executive Minister Eduardo Manalo. Iglesia Ni Cristo is known for its practice of bloc voting during elections. During the 2016 presidential election, INC communities in Agusan del Sur, Nueva Ecija, Rizal, Dasmariñas City, and Quezon City delivered 98% to 100% of the total votes to the endorsed candidates. The church supported the candidacies of Benigno "Noynoy" Aquino III, and Rodrigo Duterte during the 2010, and 2016 presidential elections respectively. On June 12, 2009, former President Gloria Macapagal-Arroyo signed Republic Act 9645, declaring July 27 as "Iglesia ni Cristo Day", a special national working holiday. On February 13, 2018, President Duterte appointed INC's executive minister, Eduardo Manalo, as special envoy for overseas Filipino concerns. Karl Keating, the founder of Catholic Answers, said in 1990 that the INC engages in anti-Catholicism and anti-Protestantism in its God's Message magazine. Keating views the church as being built on a set of anti-Catholic doctrines, and that their lessons, as well as their God's Message magazine are dedicated more to debunking Catholic and Protestant beliefs and doctrines than to explaining their own positions. Let Us Reason Ministries, an online apologetics research group, has challenged the Iglesia ni Cristo's doctrines that one can only receive salvation if they are a member of the INC, and for saying that the INC has the sole authority from God to interpret and preach the Bible, while other religions do not. They also say that the Iglesia ni Cristo fallaciously misinterprets Biblical passages in order to suit their doctrines. ^ Pig blood is a major ingredient of Dinuguan, which is a popular dish in the Philippines. ^ Quimbo, Romero. "House Bill No. 196- 17th Congress" (PDF). congress.gov.ph. Congress of the Republic of the Philippines. Archived from the original (PDF) on June 24, 2017. Retrieved September 14, 2018. ^ Camilo, Correa. "The perpetual corporate term- "Iglesia Ni Cristo (Church of Christ)"" (PDF). Securities and Exchange Commission of the Philippines. Securities and Exchange Commission of the Philippines. Retrieved 14 September 2018. ^ a b c d Quennie Ann J. Palafox. "122nd Birth Anniversary of Ka Felix Y. Manalo". National Historical Commission of the Philippines. pp. 1–2. Archived from the original on December 4, 2013. Retrieved June 7, 2011. ^ a b c d e f g h i j k l Adriel Obar Meimban (1994). "A Historical Analysis of the Iglesia ni Cristo: Cult in the Far East, Philippine Islands Since 1914" (PDF). The Journal of Sophia Asian Studies. Tokyo: Sophia University (12): 98–134. Archived from the original (PDF) on August 26, 2011. ^ a b c d e f Anne C. Harper (2001-03-01). The Iglesia ni Cristo and Evangelical Christianity (PDF). The Network for Strategic Missions. pp. 101–119. Retrieved 2011-06-12. ^ a b "Iglesia ni Cristo - Church of Christ - Official Website". Organization. Iglesia ni Cristo. p. Independent. Archived from the original on August 21, 2012. Retrieved March 25, 2013. ^ Palafox, Quennie Ann J. 'First Executive Minister of the Iglesia ni Cristo(Church of Christ)' Archived February 13, 2012, at the Wayback Machine "National Historical Institute"
^ a b c d e f g h Anne C. Harper. "Iglesia ni Cristo" (PDF). StJ's Encyclopedia of New Religious Movements. Sacred Tribes Press: 1–3. Archived from the original (PDF) on October 5, 2011. ^ a b c Johan D. Tangelder. "Sects and Cults: Iglesia ni Cristo". Reformed Reflections. Retrieved 2011-06-20. ^ a b Arlyn dela Cruz (September 2, 2009). "Iglesia ni Cristo leader Eraño G. Manalo dies". Philippine Daily Inquirer. Archived from the original on February 4, 2012. Retrieved June 7, 2011. ^ a b Aries Rufo (2009-09-02). "No shifts seen when Ka Erdie's son takes over INC". ABS–CBN News. Retrieved 2011-10-07. ^ 2018 Philippine Statistical Yearbook (PDF). Philippine Statistics Authority. October 2018. p. 62. Retrieved 12 April 2019. ^ "IFI History". Iglesia Filipina Independiente. Archived from the original on March 19, 2014. Retrieved August 16, 2014. ^ "America and Protestantism in the Philippines". Australian National University. Archived from the original on April 8, 2014. Retrieved August 16, 2014. ^ "Punta And The Iglesia Ni Cristo". www.theurbanroamer.com. The Urban Roamer. Retrieved August 24, 2014. ^ a b Juan Miguel Zubiri (2011-05-12). P.S. Res. No. 471 (PDF). Quezon City: Senate of the Philippines. Retrieved 2011-06-07. ^ a b c d e f Robin A. Brace (February 2009). "Who are the 'Iglesia ni Cristo'?". UK Apologetics. Retrieved 2011-06-07. ^ a b c d e f g h i j k l m n o p q r Robert R. Reed (2001). "The Iglesia ni Cristo, 1914-2000. From obscure Philippine faith to global belief system" (PDF). Journal of the Humanities and Social Sciences of Southeast Asia and Oceania. Leiden: Royal Netherlands of Southeast Asian and Caribbean Studies. 157 (3): 561–608. ^ a b c d "96th Anniversary of the Iglesia ni Cristo on Tuesday, July 27, 2010". Manila Bulletin. July 26, 2010. Archived from the original on July 29, 2010. Retrieved June 7, 2011. ^ a b Quennie Ann J. Palafox. "The Iglesia ni Cristo". National Historical Commission of the Philippines. Archived from the original on August 12, 2014. Retrieved June 7, 2011. ^ "History of Iglesia ni Cristo". NDBC News. Notre Dame Broadcasting Corporation. Retrieved 17 October 2016. ^ Harper, Anne. "Iglesia ni Cristo" (PDF). Watchman Fellowship. Watchman Fellowship. Retrieved 17 October 2016. ^ "46 Years of Overseas Mission: The Iglesia ni Cristo Global Evangelism Continues". The Philippine Star. 27 July 2014. Retrieved 19 September 2018. ^ "Our History". 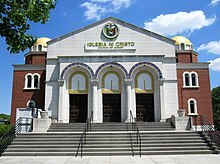 Iglesia Ni Cristo (Church of Christ). Retrieved 12 October 2018. ^ Archangel, Xianne (July 21, 2014). "PNoy, Ka Eduardo V. Manalo unveil marker for Ciudad de Victoria". GMA News. Retrieved July 21, 2014. ^ "Largest Mixed-Use Indoor Theatre". GuinnessWorldRecords.com. Guinness World Records. Retrieved October 1, 2014. ^ Cruz, RG (4 July 2014). "2014 is Iglesia ni Cristo centennial year". ABS-CBN News. Retrieved 16 October 2018. ^ Arcangel, Xianne (20 July 2014). "PNoy declares July 27 non-working holiday in honor of Iglesia Ni Cristo centennial". GMA News. Retrieved 16 October 2018. ^ Archangel, Pia (July 27, 2014). "24 Oras: Pagdiriwang ng sentenaryo ng INC, tuloy-tuloy ngayong linggo". YouTube (GMA News). Retrieved July 27, 2014. ^ Arcangel, Xianne (27 July 2014). "INC bags new Guinness world records for gospel choir, Philippine Arena". GMA News. Retrieved 2 December 2015. ^ "Featured News: Ciudad de Victoria, Bulacan, Philippines". Iglesia Ni Cristo Media. 26 July 2015. Retrieved 28 September 2015. ^ ""Felix Manalo" sets two world records". Eagle News. 4 October 2015. Retrieved 4 October 2015. ^ Legaspi, Amita (30 July 2018). "Senate adopts reso commemorating Iglesia ni Cristo's 104th anniversary". GMA News. Retrieved 16 October 2018. ^ Harper, Ann C. (2001). "The Iglesia ni Cristo and Evangelical Christianity" (PDF). Journal of Asian Mission. 3 (1): 101–119. ^ a b c d e f Iglesia ni Cristo. "A church that shares". Iglesia ni Cristo - Church of Christ - Official Website. Core Values. Iglesia ni Cristo. Archived from the original on 2013-07-31. Retrieved 26 March 2013. ^ a b Pasugo (PDF) (in Tagalog). 20. Quezon City: Iglesia ni Cristo. November 1968. p. 19. ISSN 0116-1636. Archived from the original (PDF) on July 26, 2011. Retrieved June 19, 2011. ^ Pasugo (PDF). 21. Quezon City: Iglesia ni Cristo. August 1969. p. 17. ISSN 0116-1636. Archived from the original (PDF) on July 26, 2011. Retrieved June 19, 2011. ^ "Is the Holy Spirit God?". kabayankokapatidko.org. Iglesia Ni Cristo. Archived from the original on July 4, 2014. Retrieved March 30, 2014. ^ a b c d "Iglesia ni Cristo". Catholic Answers. August 10, 2004. Archived from the original on June 4, 2011. Retrieved June 7, 2011. ^ a b c Malou Mangahas; Avigail M. Olarte (2002-04-30). "A Most Powerful Union". Philippine Center for Investigative Journalism. Retrieved 2011-06-11. ^ Bocobo, Antonio E., Jr. “On Choosing The True Religion”, October – December 1991, pp. 14,15. ^ "Islands Find a New Faith: Sect Gains Foothold". The Milwaukee Journal. June 20, 1959. Retrieved 18 February 2015. ^ "The four angels holding the winds were leaders of nations, who were also messengers, or angels, as written in I Pet. 2:13-14. The wind that they were controlling refers to war as mentioned in Jer. 4:11-13, 19. This was the war that broke out on 1914. The four leaders of nations who worked on the prevention of the war, which broke out in 1914, were Lloyd George of Great Britain, Clemenceau of France, Orlando of Italy, and Wilson of America. They were better known as the Big Four" (World History, p. 494)--(Pasugo, July 1964, p. 33). ^ Eraño G. Manalo (1989). "Lesson 22: Baptism". Fundamental Beliefs of the Iglesia ni Cristo. Quezon City: Iglesia ni Cristo. ^ "Shepherd, Harvey". July 30, 1994. Retrieved 2009-04-29. ^ "Iglesia ni Cristo - Church of Christ - Official Website". Organization. Iglesia ni Cristo. pp. Worship Services. Archived from the original on July 31, 2013. Retrieved March 25, 2013. ^ Geronimo, Jee (July 24, 2014). "Faith in action: The practices of Iglesia ni Cristo". Rappler. Retrieved July 25, 2014. ^ "Iglesia Ni Cristo (1914)". The Bereans: Apologetics Research Ministries (Philippines). Archived from the original on 2013-02-22. Retrieved 2011-06-19. ^ Levi M. Castro (May 2007). "God's Last Work of Salvation". Pasugo. Quezon City: Iglesia ni Cristo. 59 (5): 28–30. ISSN 0116-1636. ^ Hirofumi Ando (1969). "A Study of the Iglesia Ni Cristo: A Politico-Religious Sect in the Philippines". Pacific Affairs. University of British Columbia. 42 (3): 334–345. doi:10.2307/2753902. ISSN 0030-851X. JSTOR 2753902. ^ Bienvenido C. Santiago (September 2008). "We Always Ought to Pray". Pasugo. Quezon City: Iglesia ni Cristo. 60 (9): 2–3. ISSN 0116-1636. ^ Roland A. Aguirre (September 2008). "Why Prayer Matters". Pasugo. Quezon City: Iglesia ni Cristo. 60 (9): 10–14. ISSN 0116-1636. ^ "The Pasugo Magazine: Effectively communicating God's words". Pasugo: God's Messsage. Iglesia Ni Cristo (Church of Christ). Retrieved 6 April 2019. ^ Dennis C. Lovendino (March 2012). "A mandate zealously fulfilled". PASUGO God's Message. Quezon City, Philippines: Iglesia ni Cristo. 64 (3): 25. ISSN 0116-1636. ^ "Missionary works". Iglesia Ni Cristo. Retrieved May 9, 2014. ^ "I.N.C. holds 19 simultaneous grand evangelical missions nationwide". Business Mirror. February 27, 2012. Archived from the original on 2012-04-02. ^ Dennis C. Lovendino (March 2012). "United in the mission to propagate the gospel". PASUGO God's Message. Quezon City, Philippines: Iglesia ni Cristo. 64 (3): 14. ISSN 0116-1636. Multitudes of Iglesia ni Cristo members at 19 different sites throughout the archipelago join in intensified campaign to share the message of salvation. ^ "Kabayan Ko, Kapatid Ko". Iglesia Ni Cristo (Church of Christ). Archived from the original on February 18, 2014. Retrieved February 24, 2014. ^ "INC leader thanks guests who attended Church's first simultaneous worldwide evangelical mission". Eagle News Service. 28 September 2015. Retrieved 28 September 2015. ^ "FYM Foundation". INC Media Services. Retrieved February 23, 2014. ^ "A History". Felix Y. Manalo Foundation, Inc. Archived from the original on March 9, 2014. Retrieved February 23, 2014. ^ "INC holds trade summit, job fair". The Philippine Star. January 28, 2014. Retrieved February 23, 2014. ^ Cueto-Ybañez, Donna (July 9, 2012). "Iglesia ni Cristo breaks 3 Guinness records". Philippine Daily Inquirer. Retrieved February 23, 2014. ^ Chavez, Chito (2 May 2016). "INC event breaks 4 Guinness records". Manila Bulletin. Retrieved 2 May 2016. ^ dela Fuente, Weng (29 April 2016). "UPDATED: Iglesia Ni Cristo sets 4 new Guinness world records". Eagle News. ^ "Huge Filipino charity walk breaks Guinness records". Yahoo! News. February 16, 2014. Retrieved February 17, 2014. ^ Suggitt, Connie. "More than 750,000 people help Philippines-based church achieve four new records". Guinness World Records. Guinness World Records. Retrieved 14 September 2018. ^ "PH Sets Another Guinness Record with INC's Lingap sa Mamamayan". Eagle Broadcasting Corporation. Retrieved February 23, 2014. ^ Gabieta, Joey (March 16, 2014). "INC in full force in aid, relief plans in Tacloban". Philippine Daily Inquirer. Retrieved March 16, 2014. ^ "Iglesia Ni Cristo to inaugurate housing and livelihood projects for Yolanda survivors". Eagle News. January 23, 2015. Retrieved January 23, 2015. ^ "INC builds community for Kabihug folk in Paracale, Camarines Norte". Business Mirror. November 16, 2015. Retrieved December 1, 2015. ^ "Inauguration ng Housing at Eco-farming Project ng Iglesia Ni Cristo, matagumpay na naisagawa". eaglenews.ph. 16 October 2016. Retrieved 30 May 2016. ^ Katherine Adraneda (2009-09-02). "Iglesia ni Cristo leader Manalo passes away". The Philippine Star. Archived from the original on 2013-02-08. Retrieved 2011-06-11. ^ Suarez, E.T. (July 27, 2005). "Iglesia ni Cristo turns 91 today E.T". Manila Bulletin. Manila Bulletin Online. Archived from the original (Web news) on July 26, 2013. ^ "A Signature in the Sky". Philippine Free Press: 25. July 30, 1994. ^ a b Paul A. Rodell (2002). Culture and customs of the Philippines. Westport, Connecticut: Greenwood Publishing Group. p. 86. ISBN 0-313-30415-7. ISSN 1097-0738. LCCN 2001023338. LCC DS664 .R63 2001. Retrieved 2011-06-11. ^ "Fernando Zialcita, Ph.D". Ateneo de Manila University School of Social Sciences. Archived from the original on June 12, 2018. Retrieved June 11, 2011. ^ Isabelo T. Crisostomo. "Biography of Brother Felix Manalo". Pasugo (May–June 1986). ^ Bro. Marcoleta (May–June 1986). "The Central Temple". Pasugo. Quezon City, Philippines: Iglesia ni Cristo. 37 (5 and 6): 51–54. ISSN 0116-1636. The Iglesia ni Cristo completed the Central Temple in two years. ^ Orozco, Ron (January 10, 2014). "Places of worship: Iglesia ni Cristo (Church of Christ)". The Fresno Bee. Archived from the original on July 14, 2014. Retrieved July 7, 2014. ^ "Anti-poverty walk claims world record in Philippines - ucanews.com". ucanews.com. Retrieved 2018-07-18. ^ Quismundo, Tarra. "Expelled Iglesia ni Cristo minister's lawyer says bloc voting may be no more". Retrieved 2018-07-18. ^ News, Dharel Placido, ABS-CBN. "Duterte appoints INC's Manalo as special envoy on OFW concerns". ABS-CBN News. Retrieved 2018-07-18. ^ Santos, Reynaldo Jr (22 May 2016). "Is Iglesia ni Cristo's bloc voting still strong in 2016?". Rappler Philippines. Retrieved 16 October 2018. ^ "Noy thanks Iglesia ni Cristo for support | Philstar.com". philstar.com. Retrieved 2018-07-18. ^ Mangahas, Mahar. "SWS statistics about the INC". Retrieved 2018-07-18. ^ "It's Been Decided: Iglesia Ni Cristo Will Vote For Duterte and Marcos". Preen. 2016-05-05. Retrieved 2018-07-18. ^ Jimeno, Jaileen (23 July 2015). "FACTS AND FIGURES: The politically influential Iglesia ni Cristo". GMA News. Retrieved 16 October 2018. ^ Kabiling, Genalyn (14 February 2018). "INC top leader named special envoy for OFWs". Manila Bulletin. Retrieved 14 September 2018. ^ News, ABS-CBN. "TIMELINE: Iglesia Ni Cristo in crisis". ABS-CBN News. ^ "INC ex-minister granted asylum in Canada – report". Retrieved 22 July 2018. ^ Oppenheimer, Mike "Salvation", Let Us Reason ministries (2002). Retrieved July 28, 2005. ^ Oppenheimer, Mike. "The True Church". Let us Reason ministries. Retrieved 22 January 2015. ^ Hornbaker, Justin (April 15, 2017). "Upcoming Conferences & Debate [Updated]". Wikimedia Commons has media related to Iglesia Ni Cristo.